Maroons were former enslaved Africans who had escaped captivity. The latest character I wrote for my pirate sourcebook is a maroon leader, and writing that piece of fiction inspired me to paint a few of my Foundry maroons. I’m glad I did! They’re great examples of the things I love in Foundry minis, as they were easy and fun to paint, simple but not boring, somewhat uniform but still characterful and unique. 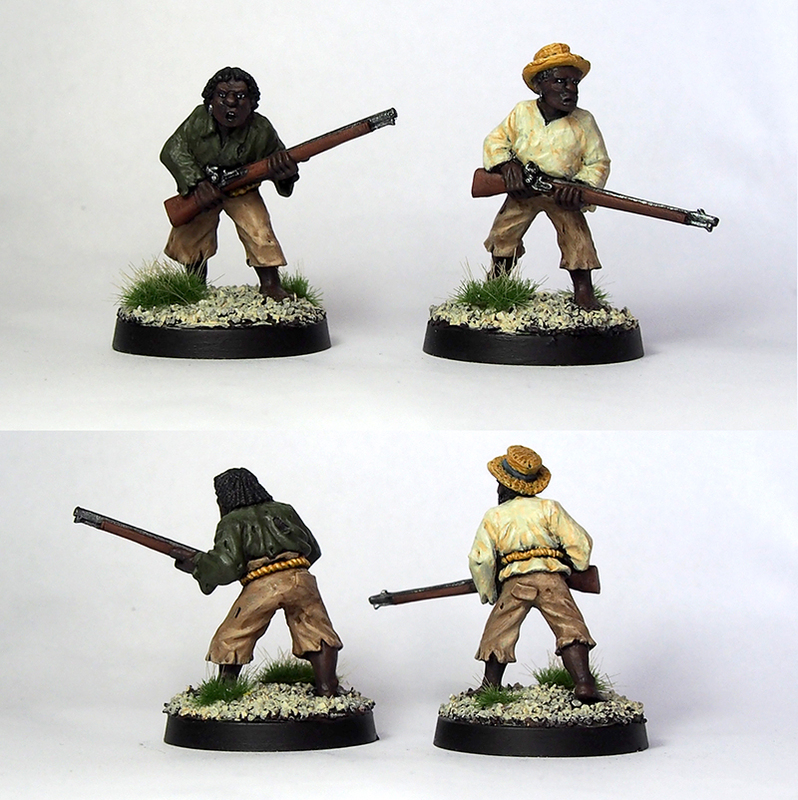 Formerly enslaved, I kept their clothing drab and a little dirty. They should contrast well with both the neat, colourful look of wealthier citizens of New Port George and the bright, sometimes showy clothing of my pirates. While the maroons will eventually be their own faction, they’ll be a part of my pirates for now. They’re this year’s painted minis # 9 and 10, and I’m starting to see why my unpainted minis pile keeps growing. Oh yeah, Maroons was a pretty awesome hip hop group as well. Very nice mate. I look forward to seeing the full faction. Thanks! I bought a pack of eight at Salute, and they’re quick to paint. I hope to have a couple more done soon-ish. Just so much other stuff to paint, it’s always a struggle to pick the next thing.